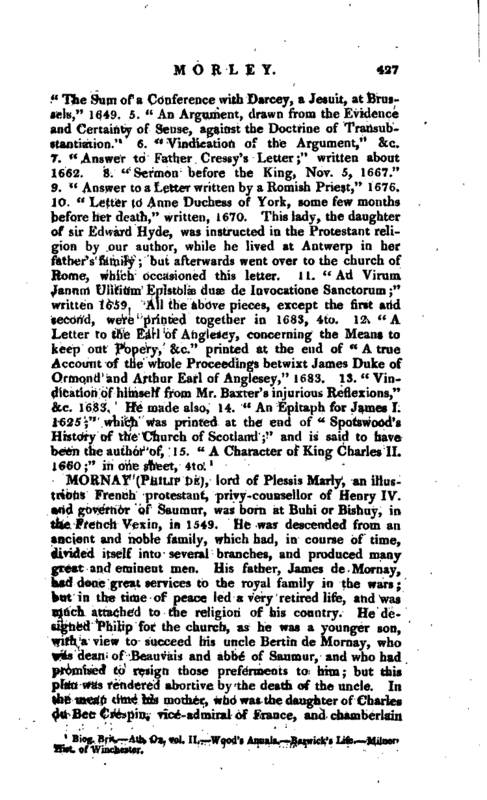 , a learned English bishop, first of Worcester and afterwards of Winchester, was sou of Francis Morley, esq. by a sister of sir John Denham, one of the barons of the Exchequer, and born in Cheapside, London, Feb. 27, 1597. He lost his parents when very young, and also his patrimony, by his father being engaged for other people’s debts. However, at fourteen, he was elected a king’s scholar at Westminster-school, and became a student of Christ-church, Oxford, in 1615; where he took the first degree in arts in 1618, and that of M. A. in 1621. After a residence of seven years in this college, he was invited to be chaplain to Robert earl of Carnarvon and his lady, with whom he lived till 1640, without seeking any preferment in the church. 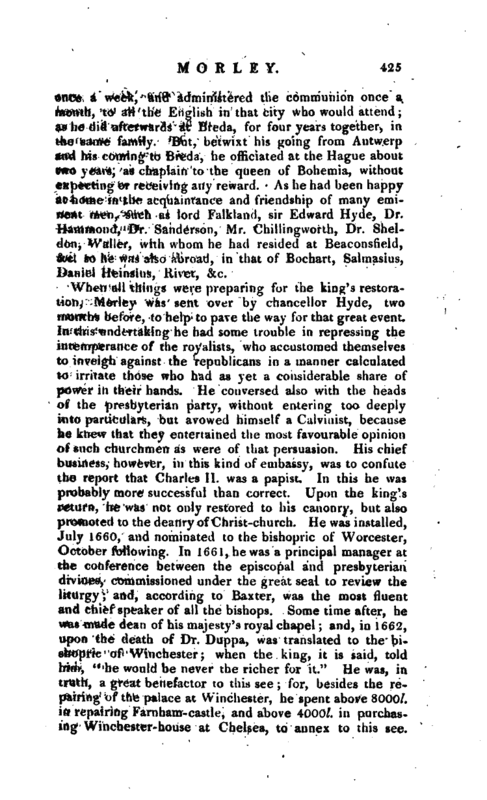 At the end of that time, and in his forty-third year, he was presented to the rectory of Hartfield in Sussex, which being a sinecure, he exchanged for the rectory of Mildenhall in Wiltshire; but, before this exchange, Charles I. to whom he was chaplain in ordinary, had given him a canonry of Christ-church, Oxford, in 1641, the only preferment he ever desired; and of which he gave the first year’s profit to his majesty, towards the charge of the war, then begun. In 1642 he took his degree of D. D. and preached one of the first solemn sermons before the House of Commons; but so | little to their liking, that he was not commanded to print it, as all the preachers had been. Yet he was nominated one or the assembly of divines, but never appeared among them, as he preferred to remain with the king, and promote his majesty’s interest. Among other services the king employed him to engage the university of Oxford not to submit to the parliamentary visitation; and such was his success, that the convocation had the spirit to pass an act for that purpose, with only one dissenting voice, although they were then under the power of the enemy. Afterwards he was appointed by the university, with other assistants named by himself, to negociate the surrender of the Oxford garrison to the parliamentary forces, which he managed with great address. Such a decided part, however, could not fail to render him obnoxious; and accordingly in 1647, the committee for reforming the university voted his cauonry vacant. He was offered at the same time to hold it and what else he had, if he would give his word not to appear openly against them and their proceedings; but he preferred suffering with his celebrated colleagues Fell, Sanderson, Hammond, &c. Accordingly in 1648 he was deprived of all his preferments, and imprisoned for some little time. Some months before, he ha been permitted to attend upon the king at Newmarket, a one of his chaplains, and he was one of the divines who as sisted the king at the treaty of Newport in the Isle of Wight. In March 1648-9, he prepared the brave lord Capel for death, and accompanied him to the scaffold on Tower-hill. In 1649 he left England, and waited upon king Charles II. at the Hague, who received him very graciously, and carried him first into France, and afterwards to Breda, with him. But, the king not being permitted to take his own divines with him, when he set out upon his expedition to Scotland, in June 1650, Morley withdrew to the Hague; and, after a short stay there, went and lived with his friend Dr. John Earle at Antwerp, in the house of sir Charles Cotterel. 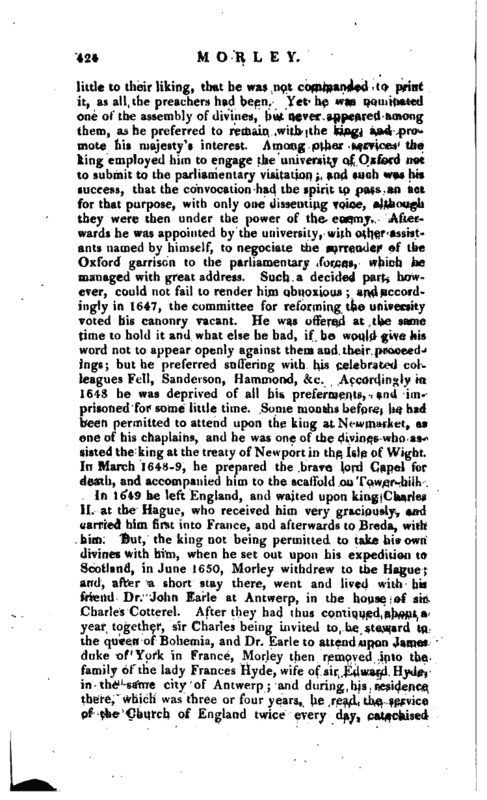 After they had thus continued about a year together, sir Charles being invited to be steward to the queen of Bohemia, and Dr. Earle to attend upon James duke of York in France, Morley then removed into the family of the lady Frances Hyde, wife of sir Edward Hyde, in the same city of Antwerp; and during his residence there, which was three or four years, he read the service of the Church of England twice every day, catechised | once a week, and administered the communion once a month, to all the English in that city who would attend; as he did afterwards at Breda, for four years together, in the same family. But, betwixt his going from Antwerp and his coming to Breda, he officiated at the Hague about two years, as chaplain to the queen of Bohemia, without expecting or receiving any reward. As he had been happy at home in the acquaintance and friendship of many eminent men, such as lord Falkland, sir Edward Hyde, Dr. Hammond, Dr. Sanderson, Mr. Chillingworth, Dr. Sheldon, Waller, with whom he had resided at Beaconsfield, &c. so he was also abroad, in that of Bochart, Salmasius, Daniel Heinsius, Rivet, &c.
When all things were preparing for the king’s restoration, Morley was sent over by chancellor Hyde, two months before, to help to pave the way for that great event. In this undertaking he had some trouble in repressing the intemperance of the royalists, who accustomed themselves to inveigh against the republicans in a manner calculated to irritate those who had as yet a considerable share of power in their hands. He conversed also with the heads of the presbyterian party, without entering too deeply into particulars, but avowed himself a Calvinist, because he knew that they entertained the most favourable opinion of such churchmen as were of that persuasion. His chief business, however, in this kind of embassy, was to confute the report that Charles II. was a papist. In this he was probably more successful than correct. Upon the king’s return, he was not only restored to his canonry, but also promoted to the deanry of Christ-church. He was installed, July 1660, and nominated to the bishopric of Worcester, October following. In 1661, he was a principal manager at the conference between the episcopal and presbyterian divines, commissioned under the great seal to review the liturgy; and, according to Baxter, was the most fluent and chief speaker of all the bishops. Some time after, he was made dean of his majesty’s royal chapel; and, in 1662, upon the death of Dr. Duppa, was translated to the bishopric of Winchester; when the king, it is said, told him, “he would be never the richer for it.” He was, in truth, a great benefactor to this see; for, besides the repairing of the palace at Winchester, he spent above 8000l. in repairing Farnham-castle, and above 4000l. in purchasing Winchester-house at Chelsea, to annex to this see. | Many other benefactions of his are recorded. He gave 300/ per ann. to Christ-church in Oxford, for the public use of that college: he founded five scholarships of lOl. per annum each, in Pembroke-college, three for the Isie of Jersey, and two for Guernsey he gave, at several times, upwards of 1800l. to the church of St. Paul, London and he bequeathed in his will 1000l. to purchase lands for the augmenting of some small vicarages. By temperance and exercise he reached a very old age, and died at Farnhamcastle, Oct. 29, 1684, and was’buried in Winchester cathedral. He was a very hard student, usually rising about five o’clock in the morning both in winter and summer, though he never went to bed till about eleven in the severest season of the year; nor did he eat more than once in the twenty-four hours. By this means he passed his life without ever being obliged to keep his bed for any sickness more than twice. Bishop Burnet tells us, that he had been first known to the world as a friend of lord Falkland’s; a circumstance sufficient to raise any man’s character. 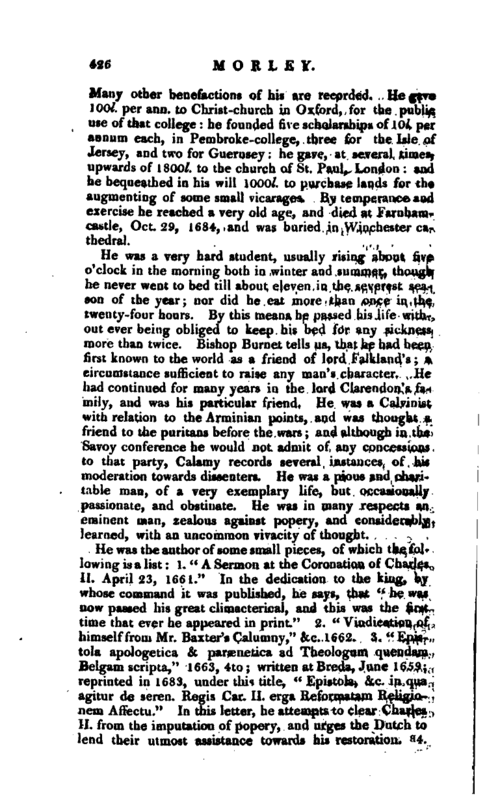 He had continued for many years in the lord Clarendon’s family, and was his particular friend. He was a Calvinist with relation to the Arminian points, and was thought a friend to the puritans before the wars; and although in the Savoy conference he would not admit of any concessions to that party, Calamy records several instances of his moderation towards dissenters. He was a pious and charitable man, of a very exemplary life, but occasionally passionate, and obstinate. He was in many respects an eminent man, zealous against popery, and considerably learned, with an uncommon vivacity of thought. 9. “Answer to a Letter written by a Romish Priest,” 1676. 1 Biog. B: uAili. Ox. vol. II. Wood’s Annals. Barwick’s Life. 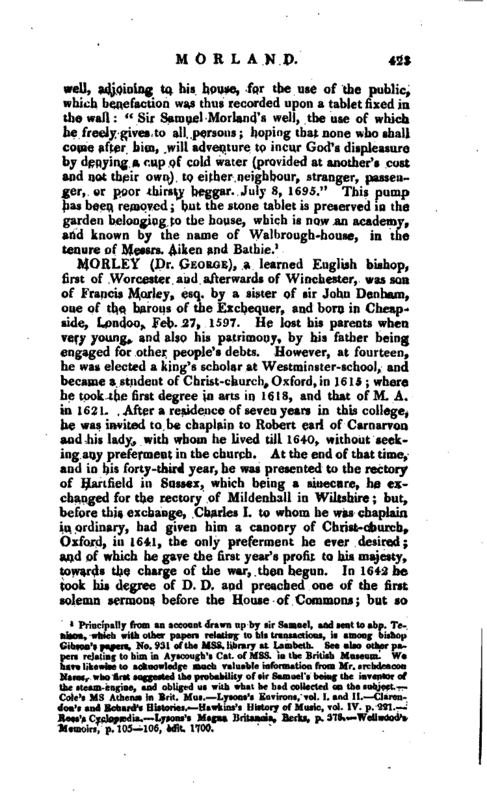 Milner’t Hist, of Winchester.